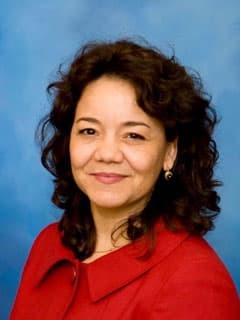 Vera De Matos Maillard, MD, is an attending physician with the Division of General Pediatrics and the General Diagnostic Gastroenterology (GI) Program at Children's Hospital of Philadelphia. Dillman JR, Carlos RC, Smith EA, Davenport MS, De Matos Maillard V, Adler J. Relationship of bowel MR imaging to health related quality of life measures in newly diagnosed pediatric Crohn Disease. Radiology. 2016 Aug;280(2):568-75. doi: 10.1148/radiol.2016151727. Epub 2016 Feb 3. Dillman JR, Carlos RC, Smith EA, Davenport MS, De Matos Maillard V, Adler J. Relationship of Bowel MR Imaging to Health-related Quality of Life Measures in Newly Diagnosed Pediatric Small Bowel Crohn Disease. Radiology. 2016 Feb 3:151727. Dillman JR, Smith EA, Sanchez RJ, DiPietro MA, Dehkordy SF, Adler J, De Matos Maillard V, Khalatbari S, Davenport MS. Prospective cohort study of ultrasound-ultrasound and ultrasound-MR enterography agreement in the evaluation of pediatric small bowel disease. Pediatr Radiol. 2016 Apr;46(4):490-7. doi: 10.1007/s00247-015-3517-3. Epub 2015 Dec 30. Dillman JR, Smith EA, Sanchez RJ, DiPietro MA, De Matos Maillard V, Strouse PJ, Darge K. Pediatric Small Bowel Crohn Disease: Correlation of US and MR Enterography. Radiographics. 2015 May-Jun;35(3):835-48. doi: 10.1148/rg.2015140002. Epub 2015 Apr 3. Rassbach W, Rubenstein JH, Elkins M, De Matos V, Greenson JK, Greenhawt M. Age-based Differences in the Diagnosis and Management of Esophageal Eosinophilia. J Allergy Clin Immunol Pract. 2015 Jan-Feb;3(1):81-87.e1. doi: 10.1016/j.jaip.2014.06.019. Epub 2014 Oct 29. Smith EA, Dillman JR, Adler J, De Matos Maillard VL, Strouse PJ. MR Enterography of Extraluminal Manifestations of Inflammatory Bowel Disease in Children and Adolescents: Moving Beyond the Bowel Wall. AJR Am J Roentgenol 2012 Jan;198(1):W38-45. Dillman JR, Ladino-Torres MF, Adler J, De Matos Maillard V, McHugh JB, Khalatbari S, Strouse PJ. Comparison of MR enterography and histopathology in the evaluation of pediatric Crohn disease. Pediatr Radiol. 2011 Dec;41(12):1552-8. Epub 2011 Jul 23. De Matos V, Russo PA, Cohen AB, Mamula P, Baldassano RN, Piccoli DA. Frequency and clinical correlations of granulomas in children with Crohn disease. J Pediatr Gastroenterol Nutr. 2008 Apr;46(4):392-8. De Matos V, Erlichman J, Russo PA, Haber BA. Does "cystic" biliary atresia represent a distinct clinical and etiological subgroup? A series of three cases. Pediatr Dev Pathol. 2005 Nov-Dec;8(6):725-31. De Matos V, Piccoli DA, Baldassano RN, Russo P. Granuloma Prevalence and Distribution in Pediatric Crohn's Disease: Importance of Upper Endoscopy and Terminal Ileal Biopsies. Journal of Pediatric Gastroenterology and Nutrition. 41(4):549, October 2005. Boulat O, Gradwohl M, Matos V, Guignard JP, Bachmann C. Organic acids in the second morning urine in a healthy swiss paediatric population. Clin Chem Lab Med. 2003 Dec;41(12):1642-58. Matos V, van Melle G, Werner D, Bardy D, Guignard JP. Urinary oxalate and urate to creatinine ratios in a healthy pediatric population. Am J Kidney Dis 1999 Aug;34(2):e1. Matos V, Drukker A, Guignard JP. Spot urine samples for evaluating solute excretion in the first week of life. Arch Dis Chid Fetal Neonatal Ed 1999;80:F240-F242. Matos V, van Melle G, Boulat O, Markert M, Bachmann C, Guignard JP. Urinary phosphate/creatinine, calcium/creatinine and magnesium/creatinine ratios in a healthy pediatric population. J Pediatr 1997; 131: 252-257. Matos V, van Melle G, Markert M, Guignard JP. Excretion urinaire de calcium, magnesium, phosphates, oxalates et urates chez l’enfant normal en Suisse. Revue Medicale de la Suisse Romande 1996;116:839-843. Guignard JP, Matos V, Toth P. Le rein immature. Revue Medicale de la Suisse Romande 1995;115:565-574. Guignard JP, Matos V. Protection of the Immature Stressed Kidney. International Yearbook of Nephrology, Dialysis and Transplantation. Eds Vittorio EA, Leon GF; Vol 10 (1995). De Matos V, Mulberg A. Perirectal Abscesses. The 5-minute pediatric consult, 5th ed. Ed. by M. William Schwartz. Lippincott Williams & Wilkins, 2008. De Matos V, Wasserman D. Cholelithiasis. The 5-minute pediatric consult, 5th ed. Ed. by M. William Schwartz. Lippincott Williams & Wilkins, 2008. De Matos V, Mulberg AE. Mesenteric Adenitis. The 5-minute pediatric consult, 5th ed. Ed. by M. William Schwartz. Lippincott Williams & Wilkins, 2008. De Matos V, Mulberg AE. ,Appendicitis. The 5-minute pediatric consult, 5th ed. Ed. by M. William Schwartz. Lippincott Williams & Wilkins, 2008. De Matos V, Wasserman D. Lactose Intolerance. The 5-minute pediatric consult, 5th ed. Ed. by M. William Schwartz. Lippincott Williams & Wilkins, 2008. De Matos V, Wasserman D. Peritonitis. The 5-minute pediatric consult, 5th ed. Ed. by M. William Schwartz. Lippincott Williams & Wilkins, 2008. De Matos V, Mascarenhas M. Cystic Fibrosis. Pediatric Gastroenterology: Requisites. Edited by Chris A. Liacouras and David A. Piccoli, Mosby, 2007. De Matos V. Eosinophilic Esophagitis Update. Meeting of the Swiss Society of Pediatric Gastroenterology, Hepatology and Nutrition. Frauenspital, Bern, Switzerland, November 2016. De Matos V. Eosinophilic Esophagitis. Department of Pediatrics, Oakland University and William Beaumont School of Medicine, Michigan, February 2015.